Dental implants have revolutionized the way dentists replace missing teeth. Innovative technology allows implants to look and act like your natural teeth. Because dental implants have so many advantages over dentures, they are now the leading solution for tooth restoration and replacement. Whether you’re replacing a single tooth, or many, dental implants are an effective and attractive solution. Dental implants truly look, act, and feel like your natural teeth. Our patients love them, and they give patients with missing teeth a better opportunity for good oral health. ● Unlike dentures, dental implants are designed to minimize bone loss, so your mouth stays healthier over the long term. ● Dental implants fuse with the underlying jaw bone, which helps to maintain your natural jaw structure. Because they are a permanent part your mouth, they look and feel like your real teeth. ● Dental implants are permanent, which means no harmful adhesives or overnight soakings. ● Dental implants look incredibly natural. You’ll be able to smile fully and confidently. ● Unlike dentures, your diet isn’t restricted with dental implants. Your teeth remain strong and functional. ● Dental implants don’t cover up your palate, which means you can taste and enjoy all of your favorite foods. ● Implants are very easy to care for. You simply brush and floss as you normally would, and schedule regular cleanings and check-ups with your dentist. Titanium implants replace the root portion of your missing teeth. We make use of cutting-edge, computer-guided surgery to place dental implants. The procedure utilizes 3D imaging and precise surgical guides to ensure expert placements. The surgery is safe and minimally invasive. Over the course of a few weeks, the implants begin to fuse with your underlying bone, making a good anchor for the replacement teeth once your jaw is completely healed. Once healing is complete, crowns are secured on top of your implants for a strong, natural finish. This procedure is a bit of a hybrid between straight dentures and dental implants. For the implant-supported dentures procedure, dentures are secured on top of dental implants. If an entire arch or even a bridge needs to be replaced, patients like this options for a few reasons. • Implant-supported dentures are more affordable than dental implants as only a minimal amount of dental implants are required to replace and entire arch of teeth. • Over-dentures (another name for implant supported dentures), typically don’t cover the palate so you can taste your favorite foods. • They restore youth – We have gotten to share in patient’s joy who switch from traditional dentures to implant-supported dentures. This single procedure can have a tremendous positive effect on a wearer’s daily life. Due to fact that patients never have to worry about them slipping out, being detected by others, soaking them at night, or skipping certain foods, patients report that implant supported dentures make them feel young again. For professional dental implants and import-supported dentures in New Hyde Park (NHP), Lake Success, Great Neck, Little Neck, Garden City, Manhasset Hills give us a call. 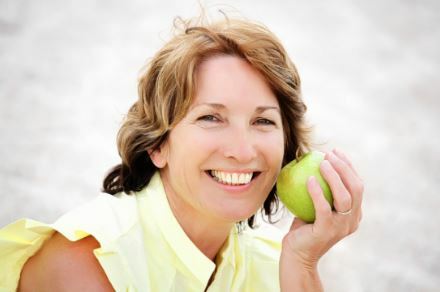 We’d love to meet with you to discuss how dental implants can help you restore your naturally beautiful smile.